The dashboard is your primary method of accessing review requests. It displays detailed information on review requests at a glance, and allows filtering review requests. After logging in to Review Board, you’ll be taken to your dashboard. You can always get back to it by clicking My Dashboard on the navigation banner near the top of the page. It also lists each group you belong to, and each group you’re watching. Each item also lists the number of review requests in that view. You can click on an item to be taken to that view of the dashboard. This view shows every review request you have created, including those that are discarded or submitted. It works like the Outgoing: Open but with your complete history. This view shows all review requests that you have filed that are open or are still drafts. This is the default view. This view shows all review requests that have been either directly assigned to you or indirectly through a group you belong to. This can be filtered down by selecting To Me or one of the group names under Incoming Reviews. This view shows all review requests that have been directly assigned to you. Each group that you are a member of will have an entry in the sidebar. Clicking on the group name will show only review requests assigned to that group. This view shows every review request that you have starred. This is useful for keeping track of review requests you are interested in that were not directly assigned to you. The main area of the dashboard lists the review requests belonging to that particular view. This is a detailed, sortable, customizable list. Clicking on any review request in the list will take you to that particular review request, while clicking on an owner’s name will take you to the list of review requests submitted by that user. Clicking on a bug link will go to the associated bug report (assuming a bug tracker has been connected). There are also a few infoboxes that appear when hovering over certain cells that can provide additional information beyond what’s normally shown in the Dashboard. Hovering over a review request will show additional details about that review request in a little infobox on the side. This includes the summary, description, types of open issues, numbers of reviews, the latest diff revision, and more. While open, you can hover over the infobox to see even more information. Hovering over the repository will show details on the commit and branch (if set). Hovering over the timestamp will show when the change was created and last updated. Hovering over the description will let you scroll to read more about the change. There are also links for taking you to the reviews, the diff, and the user’s page. Hovering over any username will show information on the user, such as their full name, e-mail address, and the local time where they work (based the timezone they have set). The bottom of the infobox provides handy links for viewing the user’s review requests and published reviews. Extensions can also add custom information to the infobox, providing details that might be specific to the organization. When using a compatible bug tracker and enabling the “Bugs” column (see Adding/Removing Columns), Review Board can show details from any referenced bug. This will include the bug number, the current state of the bug, and the bug description. Note that this functionality isn’t available for all bug trackers yet. You will need to use GitHub, Jira, Splat, or a compatible version of Bugzilla. The review request list can be sorted by clicking on a column header. Clicking once will sort the column in ascending order, and clicking a second time will sort that column in descending order. The column will have a little up or down arrow indicating the sorting order. You can click the X next to clear sorting for that column. The dashboard provides two-level sorting. You can primarily sort by one column but in the case of multiple entries for a particular owner, timestamp, etc., you can have secondary sorting on another column. This is set by simply clicking one column (which will be the secondary column) and then clicking another column (which will be the primary). The primary column is indicated by a black up/down arrow, and the secondary column is indicated by a lighter grey up/down arrow. Sorting options are saved across sessions. Columns in the dashboard can be reordered by clicking and dragging the column. The columns will reorder as you’re dragging to show you the new layout, and when you release the mouse cursor the order will be saved. Different users have different things they want to see in the dashboard. You can change which columns are shown and which aren’t by clicking the pencil icon to the right of the columns. A pop-up menu will appear showing which columns are shown and which aren’t. Branch Shows the branch information listed on the review request. Bugs Shows the bug IDs listed on the review request. Diff Size Shows a count of the removed and added lines of code in the latest revision of the diff. Diff Updated Shows the timestamp of the last diff update. This is color-coded to indicate the age. Diff Updated (Relative) Shows the timestamp of the last diff update, relative to the current time. This is color-coded to indicate the age. Last Updated Shows the timestamp of the last update to the review request. This is color-coded to indicate the age. Last Updated (Relative) Shows the timestamp of the last update to the review request, relative to the current time. This is color-coded to indicate the age. My Comments Shows a green comment flag if you have any unpublished comments on the review request, or a blue comment flag if you have published comments. This allows you to quickly see which review request you’ve addressed. New Updates Shows a message bubble icon for any review requests that have been updated or have had discussion since you last looked at it. This does not apply to review requests that you have not opened before. Number of Reviews Shows how many reviews have been done on the review request. Owner Shows the username of the owner of the review request. Posted Time Shows the timestamp of when the review request was first posted. This is color-coded to indicate the age. Posted Time (Relative) Shows the timestamp of when the review request was first posted, relative to the current time. This is color-coded to indicate the age. Repository Shows the repository that the review request is for. Review Request ID Shows the ID number of the review request. Select Rows Shows a checkbox that allows you to select the row. 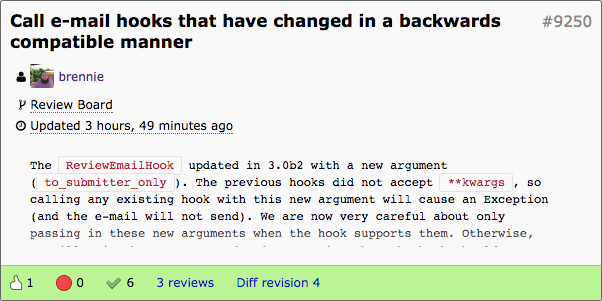 When one or more review requests are selected, the sidebar will contain bulk modification commands. Starred Shows a star indicator that can be toggled. When toggled on, the review request is starred, meaning that it will show up in the “Starred” section of the dashboard, and you will be CC’d on any discussion. Toggling the star off will remove you from the CC list. Summary Shows the summary text of the review request. Target Groups Shows a list of the assigned groups for the review request. Target People Shows a list of the assigned people for the review request. To Me Shows a chevron for review requests which directly list you in the “people” field. If you want additional information available in the Dashboard, you can write an extension that adds custom columns, which can show any kind of data you may want for a review request. These might make use of existing data in Review Board or in-house data collected by your extension. Extensions can also provide new sidebar items, which can link to a custom view of the Dashboard or a separate page entirely. In an active team, the dashboard can often get cluttered with many open review requests. This can make it difficult to keep track of what you have left to work on. There are three visibility controls for review requests: star, archive, and mute. These can be manipulated both on the dashboard (through the star column and the bulk actions), as well as on the review request page (through the visibility controls at the top-left of the review request box). Starring a review request will cause it to show up in the Incoming: Starred section of the dashboard, and will make sure that you’re copied on any e-mail notifications related to the review request. This is a good way to keep track of things which might be related to your work but not directly assigned to you, or to mark particularly important review requests. Archiving a review request will cause it to be hidden from the incoming views of the dashboard until there is new activity. This is similar to the way that e-mail clients archive threads. If you’re experiencing dashboard overload, archiving can quickly streamline your view to show only the review requests that still require your attention. Muting a review request works like archiving, except it will never re-appear on your dashboard until you explicitly unmute it. You will also not be included on any e-mail notifications for muted review requests. This is good for tuning out your office mate. On the incoming dashboard views, the Show archived link at the top will toggle on all of the archived and muted review requests, allowing you to find them again. This setting is sticky when clicked, and can be reversed by clicking Hide archived.